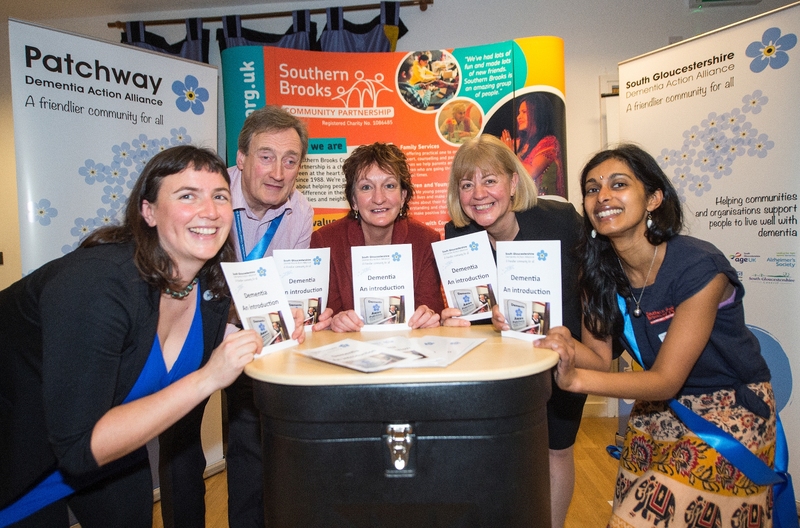 More than 100 individuals, community groups, charitable organisations and businesses in South Gloucestershire attended an event today (January 12, 2015) to mark the official launch of South Gloucestershire becoming dementia-friendly. South Gloucestershire Dementia Action Alliance, which will support communities and organisations in becoming dementia-friendly, launched at Coniston Community Centre in Patchway on Monday, January 12. The alliance is a Southern Brooks Community Partnership project in collaboration with Alzheimer’s Society, NHS South Gloucestershire Clinical Commissioning Group (CCG) and South Gloucestershire Council. Paul Frisby, Partnership Manager at South Gloucestershire CCG, the GP-led body responsible for planning and buying healthcare for the local population, said: “We’re absolutely delighted with how many people have come along to the launch today to show their support in making the whole of South Gloucestershire a dementia-friendly community. “The Dementia Action Alliance is a two-year pilot project jointly funded by the CCG and the Public Health and Social Care departments of South Gloucestershire Council to support communities and organisations across South Gloucestershire in becoming dementia-friendly. “Following a successful pilot in Patchway, which saw the town become the first dementia-friendly community in South Gloucestershire, work to support communities and organisations across the whole of South Gloucestershire become dementia-friendly has been commissioned. Community Development Worker for Southern Brooks Community Partnership, Eleanor Fairbrother, who is leading the project, said: “We have launched the Dementia Action Alliance because we want to get everyone to talk about dementia to reduce stigma and stop people becoming isolated unnecessarily. Amanda Deeks, Chief Executive of South Gloucestershire Council, was a keynote speaker at the event. She said: “The South Gloucestershire Dementia Action Alliance is working towards making our region a place where people with dementia and their carers are understood, respected and supported. We aim to enable people with dementia to feel included and involved in our communities, and importantly to have choice and control over their day to day lives. Dr Peter Bagshaw, Clinical Lead for Dementia at South Gloucestershire CCG, added: “Dementia is one of the biggest health crises facing the UK at the moment. There are currently 670,000 people in England who have dementia and an estimated 21 million people in England have a close friend or family member with dementia. In South Gloucestershire, it is estimated there are more than 3,000 people with dementia. “One in three people over the age of 65 will develop dementia, a very high proportion. But people with dementia can live well, and it is the responsibility of the rest of the community to help them do so. Pictured from left to right are: Eleanor Fairbrother, Community Development Worker for Southern Brooks Community Partnership, Paul Frisby, Partnership Manager at South Gloucestershire Clinical Commissioning Group, Julie Close, Director of Southern Brooks Community Partnership, Amanda Deeks, Chief Executive of South Gloucestershire Council, and Subitha Baghirathon, Community Development Worker for Southern Brooks Community Partnership.